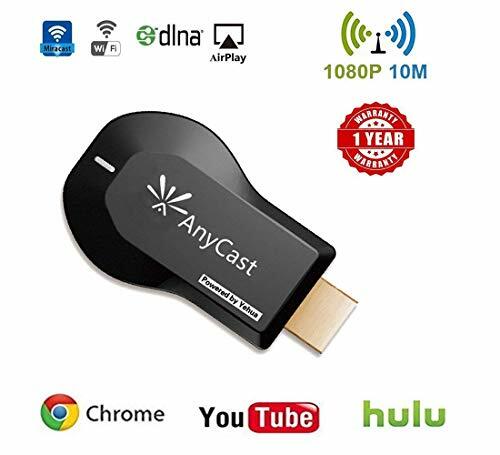 The wifi display dongle supports DLNA/Airplay Mirror/Miracast/Ezcast Function for iOS/Android/Samsung/LG/ Nokia/iPhone/iPad Air/Mini/Pro devices, which is perfect for watching movies, conference use and gaming to pursuit different audio-visual feast. Compared with traditional receiver, the item has better connectivity and strong anti-jamming that give smoother data transfer. ★ Want to share screen with people at home, meeting, conference at the same time. Plug into HDMI port. Set your TV to the HDMI port you picked. Mirroring(iOS) Pull up Control Center and tap "Airplay Mirroring". Once you tap it your iPhone/iPad screen will now be cast to your TV. Mirroring(Android) Pull down "Control Center" on your phone and turn on Miracast (Screen mirroring/ Multicreen / Smartview) and select it. Stable Signal:Wireless HDMI Receiver Wi-Fi: 802.11b / g / n 2.4GHz Wireless WiFi 150Mbps. (with External WiFi Antenna to provide 10M WiFi Signal Coverage). And do not need to push button to change interface for ios or android.Easy to operate. Wireless Connection: Cast your photos, videos, music, documents, and browser from your laptop, desktop, and smartphone.Compatible with iOS, Android, Windows, and Mac OS. If you have any questions about this product by Qber, contact us by completing and submitting the form below. If you are looking for a specif part number, please include it with your message.